Advice for Athletes of All Levels. Ask me any question you have about training, sports nutrition, injury, mind-set, strategy, and so on, and I’ll respond personally. Questions that apply to a lot of people, or just catch my fancy, become posts on the Home page of this blog. Rich, Continued best of luck. You’ll get there, no doubt. Keep us posted on your progress. Love this site! Thanks again for the advice! After 10 days of the flexible 3/4 inserts (by the way I use them in all my shoes, not just my running shoes) and the Strassburg sock at nite, I have ZERO PF pain in my heel! I had been to the Dr, Chiropractor and running store numerous times and none of them suggested the inserts and strassburg sock for my pf pain. You’re awesome, thanks again! Thanks for your kind comments. I’m glad to hear that the inserts and Strassburg sock are providing some relief for you! Keep on running! Hey Marshall, first of all i cant wait to read your book. Next i cant wait to attend one of your ultra training camps and am sorry i ll miss the one in October. Anyway i have been back into running for about 20 monthes and in that time have built up slowly to the point of running 100 plus km a week. With my injury ( Patella Tendopathy) causing me to drop out of the Death Race in July i then took a couple weeks off and then started back at 40-50km a week. Im feeling strong and want to ramp up the miles and train for a 100 miler. My question is, if im feeling good like this, can i continue to increase mileage at 10% or so a week and log bigger miles. Many of my friends are telling me i need to keep low mileage for a while and “recover” recover from what im not sure. So how long do you think i need to train for a hundred miler? My base is 2 marathon races and a 50 miler in 2010. A dozen or so 60-70 km training runs since May and 70 km at death race. It’s always smart to be prudent after recovering from an injury, healing time varies with each individual. To be on the safe side I would moderate my mileage and include stretching and cross training for up to 6 months and then gradually increase your mileage adding a few miles per week until you have a base of at least 80 miles per week for a hundred miler. Your training should include after you have healed, one day a week of these training activities: one day of speed work, one day of cross training, one day of a longer run of about 30 miles minimum. Take at least one day off a week and up to two (even better). Heal first, train hard later. Thanks Marshall. I really appreciate the sage advice. I’ll let you know how it turns out in ABQ… I’m starting to think that the training is the hard part; the race is over before you know it, but the training is like a tootsie roll (lasts a long time). manage 40-45 miles per week (including long runs in the range of 25-31)? Hi, Matthew! Marshall is in the Amazon right now, but I’m sure he’ll reply when he gets back after the first of the month. Thanks for your patience! Congratulations on finishing the Pony Express Trail 50. Your time reflects a great level of commitment. I agree and I’m convinced that you can do another 50 miler down the road, in a time that is even quicker. The answer to your question about improving that time is yes, yes, YES! The good news is that walking an entire 50 miler at a 3 mile per hour pace will yield you an approximate 17-hour finish, if you stay steady and minimize stops. My suggestion would be to try a walk-run mix throughout your next 50 miler. For instance, if you were to run 2 minutes and walk for 4 minutes throughout that 50 miler, you could conceivably finish in the 15-hour range. My recommendation would be to check out Jeff Galloway’s website, http://www.jeffgalloway.com, as he has the walk-run training and racing programs down to a science. Good luck and forge ahead! Question: About Max Heart beat – at my age of 62 – in training, esp the harder training and when you are not in top shape and you resume to more intense training what is the zone of heart beat (pulse)? At 130 it feels okay, but sometimes it goes up to 140 and higher. Is 150 too high for too long a time? Hi Albert, it’s good to hear from you way up there in Canada. Hope your weather is allowing you to train. At the age of 62, your max heart rate should be about 158 beats per minute. If you are getting back into shape, it is reasonable to back off of that max heart rate up to 20% or more. If it feels okay at 130 bpm, that is great as you are benefiting greatly by moderate running. It’s okay to get your heart rate up to 140 or even 150 for periods that are manageable without overdoing it. In theory you should be able to maintain the 150 bpm for extended periods of time, but over the long haul, I would advise to keep your heart rate in the 130 to 135 bpm range for ultras. Good luck, and I enjoyed reading your book, Sand in my Shoes. I started running just a year ago and completed my first marathon in 4 hours. I am 50 and I would like to do a 50 mile run. I am consistently doing about 30-35 miles a week. 1) When will I be ready for a 50 mile? 2) What do I need to get there in terms of training? 3) Can you suggest a 50 mile race for a beginner? Are there any in California? Nice job on the marathon … that’s a respectable time, and your consistent mileage will go a long way to helping you finish a 50-miler. Considering your consistency, and if you are not experiencing any nagging injuries, you could be ready to do a 50-miler in as little as 6 months to a year. Building a good base is the key, so you would have to build up your mileage over time to about double what you are currently doing. You do need to ask yourself a couple of things. Do I just want to finish and not pay too much attention to time? How much time am I willing/can I devote to training? If your goal is just to finish, you may be able to train as little as 50 to 60 miles during your last 2 to 3 months of build-up to your 50 miler–that is of course including 2 or 3 long runs of up to 25 to 30 miles that would be included in the weekly mileage. Build up your mileage paying attention to not increase your weekly mileage by more than 10% every couple of weeks. Take care to stop running, or back off your training mileage, if you develop an injury. Easy does it for this first 50-miler! A good website that has a listing of ultra runs in California and other states is: http://www.ultramarathonrunning.com/races/usa.html#CA . Some of the more popular California 50-mile runs are: American River 50 Mile Endurance Run, April; Avalon Benefit 50 Mile Run, January; Headlands 50 Mile Endurance Run, August; Pony Express 50 Mile Run, February; and the Tahoe Rim Trail 50-Mile Endurance Run, July. The trail runs are traditionally a bit tougher, but easier on the feet, and the scenery will blow you away! Good luck and check in often. Thank you very much for taking time to answer my questions. I have set my goal to do 50-miler before my 51st birthday. Dear Marshall: I just wanted to check-in and say hello. I saw your name in an email a friend forwarded to me about Ralston and thought I should say hello. I never will forget the hospitality and advice you provided me prior to my Everest climb in 2006. It was crucial to my success. It was incredibly gracious and I will forever be indebted to you. If you’re ever in Santa Fe, please call. Great to hear from you. I’ll be down in Santa Fe speaking at the Wilderness Medicine Conference and conducting a 3 hour class. Let’s get together. I’ll be selling my new book “Running on Empty” there too. Your acheivements and story are inspiring, but not sure how an average Joe can finance such awesome adventures. How did you finance or afford to do what you’ve done? Shane, it’s a reasonable question, one that I address in detail in my book, Running on Empty. The short answer, in the meantime, is twofold: 1) my own money comes from hard work in a company I built over many years–a really “glamorous” business, pet food/rendering–along with the income we have from our corporate farms, so I’ve used a bit of that to pay for some of my adventures; and 2) sponsors, who have generously donated money and products to support my participation in athletic contests. See the “Partners and Sponsors” links to the right for a list of the most active. I’m planning on running in the Relay Iowa 6-10-11 where 6-12 people in a team run across Iowa 340 miles. The director is trying to find a team for me and asked me if I could do 28 or 38 miles total (not at once) in a weekend, I said I have over 5 months to train I could probaly do the 38. My weekly mileage is 30-45 miles. He said each leg is 5-6 miles. Do I need to do much training and if so what should I do? Jean, you could likely do this cumulative ultra distance with the weekly training mileage that you’re putting in now. The trick during the relay is to do the mileage slower than usual, as the cumulative effect will catch up with you before the weekend is over. Having said that, it would serve you better to bump your mileage up to 50 to 60 miles per week, peaking a couple of months before you run the relay, and holding that higher mileage up to a couple of weeks before the actual event. Then taper down to 35 or 40 miles per week two weeks before the run and 20 miles or so the week before the run. I’d suggest you do one long run per week, starting with 10 miles and building up to about 20 miles at the peak of your training as suggested above … now here’s a big difference: split the long run into two sessions, so do a combination of 5 and 5 miles for 10 (give or take), and 10 and 10 miles for 20 on the same day. You could even do three sessions just to get your body used to cooling down and revving up. In other words, you want to simulate the conditions you will be experiencing during the relay. Good luck! You will do fine, and remember to eat and stay hydrated before, during (eat small amounts of food often such as chips, pretzels or hard candy), and after each leg of the run. Let me know how it turns out. Thanks I will. It starts on a Friday, so should my 20 miles before that and should I run the day before or take that day off? Also any advice what I should take with me. We run day and night and from the photos of last year the carload not running tries to catch sleep on park benches or on the ground so I know a sleeping bag, but anything else that might be essential. Thank you for the advice, I’ll start bumping up my miles gradually this coming week. Yes, do take the day before off, you will deserve it after all your hard work. Get a comfy sleeping pad too and try and make your sleeping conditions as user friendly as possible. DO NOT try and train for sleep deprivation as I’ve found that does not work. Believe me when you get really tired, you will fall asleep amost instantly. Even 10 to 15 minutes will be refreshing. I’m excited for you, what a wonderful venue. Thank you for your great advice, it helped me to get back out there running when it was my turn to run again. You where right about being able to sleep if tired enough there was a few times that when I got done running that I curled up on the van seat and slept. I was lucky that the people I ran with was a fun crowd, I think that was one of the things I was scared of is that I didn’t know any of these people until the night before the run. I found out that this was the worlds longest continuous running event which was exciting. It was fun to run through towns in Iowa that I heard of but never been through. There were only 4 teams running which is to bad since the money is going to a good cause, a majority of the proceeds went to Katies crusaders an organization dedicated to giving help to Iowa families dealing with breast cancer, Bill the race director’s wife was diagnosed with bone cancer last year and despite being tired and just getting done with chemo a month or 2 ago she was out on the road with Bill checking in with us runners. They are wonderfull people that I had the privilege to meet. Hes hoping to get closer to 20 or more teams next year but it’s been hard to get the word out about the run. Thank you again for your advice you are an inspiration Marshall. Great site! Appreciate all the info and really looking forward to your book. My question; is 8 weeks long enough to prepare for a 50K? I just signed up for the Cheyenne Mountain Trail Race in Colorado Springs on April 23. This will be by far the longest distance I’ve ever run and I’m hoping I didn’t bite off more then I can chew. My longest trails runs in the past year, where back-to-back half marathons in Boulder & Colorado Springs last October. But about two weeks after that, I developed a nagging pain in the lateral portion of my left knee(lateral tendon or ITB at knee joint), which wouldn’t go away and kept me from running even a couple miles, so I stopped running completely for about 2-3 months. I just started running again within the past 2 weeks and took it very slowly the first week, doing only 2 runs of about 4 miles each with a couple days rest in between. My running log this past week was as follows: 6 miles, 3.5 miles, rest day, rest day, 7 miles, rest day, 10 miles. So far….there’s no pain at all in my knee and my legs feel great!! Since I live in Boulder, I enjoy doing most of my running up Green Mountain(saw Scott Jurek & Geoff Roes up there yesterday), which means quite a bit of elevation gain/loss and can also be hard on the body(knees). Back to my original question; if I use the 10% increase in weekly milage formula, do you think it’s realistic for me to be able to comfortably(or reasonably) complete a 50K in 8 weeks or am I reaching too far, to soon? I’ll be 46 in August and was a competitive “single speed” mountain bike racer up until the age of 42, but the last serious running I’ve done prior to the two half marathons last year, were a couple of marathons I did about 12-13 years ago. Sorry for the late reply, yours fell through the cracks 🙁 , sorry. How is it going? The race is coming up and if you are doing okay with the 10% increase, you should be okay, just take it easy, run uphill moderately and downhill gently. I do not think it is unrealistic to do the 50K given that you do have a pretty good long term base. I wouldn’t expect too much out of your body though and take it easy for sure. Go out slow and if you are experiencing pain, STOP. Thanks for the reply and no worries, I know you’re a very busy man. Ok, just a quick follow up. I still have about 6 weeks before my race and things have been going pretty well. I’m doing about 4 runs a week averaging 8-10 miles for 3 of the runs, but my long run is still only averaging 14-17 miles at this point. 1. What should my goal be for my “long” run over the next few weeks, as it relates to training for a 50K? 2. The race I’ll be doing is a 25K loop, so I’ll do two loops. The elevation gain per loop is 2500 ft, so it’s 5000 total over the 50K. The trails I’m running in Boulder are considerably steeper, with some of them having a gain of 2700ft in the first 3.5miles and total gains of 4000-5000 ft on a 10 mile run. My question is; Do you think it’s beneficial for me to train on hills with this type of elevation gain for my race or should I be running on some “flatter” trails? Any additional thoughts and/or comments would be appreciated. I take a lot of inspiration from you, because you started your running career much later(in your 30’s), then quite a bit of most other top ultrarunners in this world. And you accomplished so much into your forties and continue to accomplish a great deal beyond, so this gives me(and I’m sure many), great hope that it’s not too late. I have a question about training. My situation: basically, I am an unqualified runner coming off of an Achilles’ Tendinitis/apothy(?) injury who has been talked into signing up for the Canadian Death Race (July 30) by my brother in-law. The best advice you could probably give me is, “Don’t run in this race! You don’t have enough time to get ready!” But I have already rejected that advice from a number of people, so I’m looking for advice DESPITE the fact that I probably should not even be attempting to run it (tired of ppl telling me I won’t be able to do it!). I have spent most of my years (I’m 28) training for boxing and mixed martial arts, so running for me was never an end in itself. When I decided to ‘become a runner’, I found out that I am injury prone (shin splints and Achilles’ tendon issues). However, after recovering from an Achilles’ Tendon injury in January, training has been going pretty well. I have begun stretching religiously (using especially the ProStretch stretching system), taking some supplements (Glucosamine, Chondroiten, L-lysine, Glycine), doing some strengthening exercises for my calves, and running barefoot some, albeit with caution in light of my Achilles issues. A combination of all these + some good old fashioned placebo has me feeling pretty good! Last week I ran (miles): 7; 4; 8; rest; 11 (lots of hills); 10; and biked for an hour Monday. I’m hardly even sore today. My main question is this: The current training program I am roughly following (http://www.desertskyadventures.com/resources/plans/100mile.html) has me doing two long runs back to back on the weekends, rather than doing one extensively long run. Does this sound like an appropriate method for training for a 125k mountain race (I will be training hills at the Red River Gorge and at higher altitudes for the last few months on the Appalachian Trail). If you would advise against this, do you know of another good source for training plans for such a race? Lastly, would you follow the principle of increasing mileage 10% a week? I’m afraid that if I do that, I won’t have enough time to really build a good base for the race. I’m trying to find the balance of pushing my body as hard as I can without causing injury, which I know is largely subjective, but I could still use some general advice. Any thoughts you have will be greatly appreciated! I used to do one long run on the weekends but I have revised that over the years and believe that two longer runs back to back seem to be VERY effective. Take for instance instead of doing one 30 miles run, do a 20 then a do a 10 or 15 the next day. This helps aid recovery and the damage one long run can do, but I think your body “gets it” just the same. Following the 10% rule applies mostly to a novice. The more experience you have and more of a base you build up over the years, the more durable you become and you can increase mileage dramatically. But if you start to feel an injury coming on, then revert to cross training. If you feel tired all the time, give yourself a rest. So to answer your question, yes you can build up mileage faster, but given your background of injury, I would be careful. Better to do a bit less training and ensure you don’t injury yourself. There will always be another race, but if your heart is set on this one, then do it VERY conservatively! 2) How much recovery does a person need in terms of training? I run about 40-50 miles a week plus bike and do yoga. Do you still take one day off a week? What do you find beneficial? 1) I haven’t tried the Hoka One shoes, but looked at them. The plus I see for the shoe is more surface and volume to grab the road and they appear to be very well cushioned with the foot setting down well into the inner sole…and they appear to have a roomy shoe box. All good. Having said that I wonder if they would be prone to catching rocks and roots plus how stable are they (it would appear they are). How much do they weigh? They are certainly pricey, but if they are a bomb proof shoe that works for you I would say go for it. 2) I used to train 7 days a week but have since modified my training to include at least one day per week for recovery. With all the cross training you are doing you are doing, you certainly are on the right track as you are complimenting your running with yoga and biking, excellent. I usually follow my long day workout (LSD) with a rest day and then feel fresh to get back to training the day after. Good luck you are certainly on the right track! I am a young runner (18), and am thinking of training for a 50k. I have done a few half marathons, and occasionally throw in longer runs (18 miles or so) without any issues. How much time would you recommend I leave for training, and what do you think a good weekly mileage goal is? I am glad I found this site, I followed your run across America and have since been a big fan of yours. 50 kilometer distance requires essentially the same training approach as running a marathon. For good results you can target about 60 miles per week, better is 80 miles per week and after you have had some experience you can kick it up to 100 miles per week for optimum performance. The real difference would be to bump up your long run to 20-24 miles, or do a long run of 16 miles (give or take a mile or two) on one day and follow it up with a 12 or 14 mile run on the next day. Either method works and you should do this long run 3-4 weeks before the ultra. Be sure to take a rest day after your long run/runs. Let me know how you are doing! I wanted to thank you for the great advice on running the Relay Iowa race but unfortunately its a month away and nobody has excepted me on their team, but at my work I have my eye on some of my co-workers to rope them into making a team with me for next year I keep telling them they have a year to train for this and a couple of them are interested the others will need convincing. Thanks again. Spoke to soon just got an email from sombody looking for more runners for his team, looks like Im going to do this thing! I’m training for my third marathon (San Francisco, 7/31/11) at age 53. I was a runner back in the 80’s, but put it aside for cycling until I prepped for the NYCM in 2009. Since then I’ve been pushing for a modest goal of ten marathons by age 60. I am about halfway through “Running on Empty,” and I really love it. While I don’t run with music in the actual races or the really long runs, I do wear my headphones for 90% of my training runs. In your book, you mention a few titles from your personal playlist and I was pleased to see “Say Hey” and “Money for Nothing,” which are also on mine. Would you care to share a more extensive list? Listening to the songs you like while you’re out on the road would be an excellent motivator, in my opinion. For some reason, the playlist I put on http://www.marshallulrich.com/extras.htm isn’t showing up right, but if you go to iTunes and search the store for “Marshall Ulrich’s Transcon 2008,” you’ll find all the songs I played repeatedly during my cross-country run. Also, any advice on recruiting more runners to our team? We have post-close entries available until Sept.1 as we are an official charity and sponsor of the Chicago Marathon. Charities are having a rough year filling remaining entries, marketing efforts just are not pulling in the runners. (Economy may be hurting peoples feelings on asking others for money) thanks and your stories are inspiring! Unfortunately, I will not be in the Chicago area in late August; however, I will be at the Expo for the Chicago Marathon in October. I’d be delighted to meet you, so drop by the Marathon & Beyond booth to find me! Suggestions for training would be to ramp up mileage to at least 30 to 40 miles per week of running, and do a couple of runs about a month before the marathon of 18-20 miles. Being consistent with training and running 5 times per week is most beneficial. For the marathon, drink at every aid station and start out slow … they can always speed up the last third of the marathon if they are really feeling great. Pulling in more charity running members is a tough one — I went online and noticed you are one of the three who are still looking for runners, so I wonder how it’s going? I will not be running, as I do not have an entry, and raising money for a charity is difficult, as I have my own that I’m focusing on. Do you know Jim Simone, who raises money for the Harbor House? I really enjoyed your book. Thank you for sharing your story! As an ultrarunner attempting to raise funds for a local charity, I am curious how, specifically, you manage to raise thousands and thousands of dollars with a single athletic endeavor (such as your Badwater Quad or summit of Everest). You mention this fundraising success in your book, and I just don’t understand how it is done. I don’t understand how, by taking on an impressive physical challenge, one person motivates people to donate thousands of dollars. Clearly you can’t raise that much money by simply asking personal friends and family to make small donations. Where is the connection between “Hey, I’m going to run across the Mojave desert 4 times” and “Hey, how about donating a thousand bucks to the Sisters if I do it”? How do you go about getting those large contributions? How did you raise the money when you did the Quad? As someone with no personal connections with wealthy individuals, business executives or major media outlets, it is difficult to understand. Did your previous notoriety as an endurance athlete and/or your success building your own business and being a business owner with some leverage play a significant role in your ability to raise funds? Thanks! We are raising money to support an organization that feeds hungry people here in our local poverty-stricken communities. They target children, especially, in recognition that their physical needs must be met before they can be expected to achieve academic success. (A child preoccupied with an empty tummy cannot be expected to perform well in school.) Any insight into fundraising success would be much appreciated! Thanks for your kind comments about Running on Empty and for your questions about fundraising. While I have raised hundreds of thousands of dollars for various charities — most significantly for the Religious Teachers Filippini for their educational, housing, and healthcare missions in Eritrea and other countries — you have to realize that I have been running and fundraising for about 30 years. Some of my efforts, like the Badwater Quad, got national TV exposure, including an appearance on the Today Show with Matt Lauer. along with my own efforts. There are so many great causes out there, and it sounds like you have found something that you are passionate about. That’s the real key. It will take a lot of time and effort: not just doing the event, but reaching out to friends and family and local businesses, and possibly coordinating efforts with an established charity that supports children in need. Best of luck! I am a big fan of yours and loved reading your book. I am 17 years old and in training for my first marathon, and I plan to start moving into ultra races in the next 6 months or so. I am planning on pursuing some sort of career with endurance sports. I am a strong believer in the value and importance of serving others. I am going into the Army after college, but I am only planning on staying in for 4 or 5 years. Afterwards I have been thinking about trying to take a year or two to compete in extreme endurance events to raise money for charity. Do you have any advice or thoughts on the feasibility of that idea? Assuming I can train hard/smart enough up until that point, do you think it would be possible to take a year or more just to train and compete in endurance events, maybe while being supported by sponsorships? Or do you have any other ideas on ways to better focus my time and efforts, possibly while working with or for a particular charity? Any advice you have would be greatly appreciated. Honestly, Jack, it takes time and hard work to get noticed. Just keep on doing what you’re doing with enthusiasm, and it will eventually work out. It was an honor to meet you at the Pike’s Peak Marathon Expo and to get your signed book. It was very gracious of you and your wife, Heather, to take the time to visit a few minutes with each person that came by and to give a few words of encouragement and advice. That was much appreciated! I have read your book and was intrigued by how many amazing things you have accomplished! You certainly have an excellent work ethic and the drive to make your goals happen! From the title of the book it seems that you were running on empty for a long time, trying to find something. May I respectfully suggest that the void can only be filled by God. He is the only One that can give the “peace that passes all understanding”! He alone can fill your life with joy and purpose. He has already blessed you with a wonderful wife who cares and ministers to you so lovingly. But the One who created you longs for you to have a relationship with Him, and offers you hope and life beyond this one full of pain and sorrow. On another note, I would also like to speak a positive word for a plant-based diet. There is mounting evidence that getting protein first-hand (from plants) rather than second-hand (from animals who make it from plants) is easier for the body to assimilate and you don’t get all the diseases and problems associated with meat (cancers, heart-disease, high cholesterol, diabetes, etc.). I do agree with you about keeping your diet balanced and simple. If you are open to doing a little research, there is a wealth of material out there. I recommend the book, “The China Study” by Dr. Colin Campbell. Dr. Neal Barnard has several books including “Breaking the Food Seduction.” The new movie “Forks Over Knives” is out of theaters and on DVD now–an excellent view. You can also go to ForksOverKnives.com. Once again, it was very nice to meet you and your wife and I wish you well on whatever other goals you set for yourself! It was great to meet you, too! Indeed, dietary needs and decisions are highly individual, and I respect each person’s choice. Thanks for your comments, Linda. Loved your book. I’m a 52 year-old tennis pro that as had 3 minor arthriscopic meniscus surgeries and want to get back into running. I’m wondering if you’ve ever had similar surgeres and, if so, how have you adjusted your training as far as running and cross training to protect your knees? Greg, thanks for your kind words about the book! And to answer your question, I did have meniscus surgery about 15 years ago. To support/protect the knee (and this is just good advice/common sense for any runner), get a good shoe. I have heard good things about (but haven’t tried) Hoka running shoes. Also shorten your stride so that you’re sure not to strike on your heel–a midfoot strike is the best. And just in case you were wondering, forget the barefoot/forefoot running. That will cause other problems. Good luck to you! Congratulations on 3 years, I meet you at the Des Monies Marathon and finished your book in three days. I learned a lot about my running and it has pushed me to the next level. The Des Monies marathon was a tough race, but the next half I ran on Halloween was my best in years. I am planning my first multi-day ultra over Thanksgiving weekend with my running buddy for whom you signed your book. November 4th is an auspicious day for me as well, it is the day two years ago I started my daily running streak that has reached two years. Thank you for telling your story and keep up the good work. Congratulations on your two year running streak! Keep up the good work. I will likely speak at the Des Moines Marathon next year, so I’ll see you there (I hope). Last night I purchased your book as a Kindle. Probably I am not the first to consider extreme physical endurance efforts as a model for excellence in other endeavors. I am 62. It is my desire to “mini” emulate some of your accomplishments as a “proof” of my aliveness. Irreversible injury is my worry predominately knee and hip joints. Through study I am aware of the debilitating effects of maladaptive diet on joints (and on the body of course). Diet is controllable. Marshall Ulrich grinds away running shoe after running shoe in his endurance travails. What is the effect on the joints? Mr. Ulrich I wonder if you would comment on this? Hey, Dwight! Congratulations on thinking that you can and should do more physically, and your concern about the effects of running (high impact) can have on your joints. Yes diet is controllable, just make sure you are taking calcium, glucosamine and chondroiton. Forget the barefoot/forefoot running; in the long run it will make things worse, as most people normally are mid- to rear-foot strikers (something like 95%), so it’s tough to change the way you run. You can strive to become a mid-foot striker by simply shortening your stride if you are a heel striker (I am, too). Then pick a well-cushioned shoe. I’m trying the Hoka Ones, and they are very lightweight and cushioning is super. They are a neutral shoe. What out for the minimalist shoes…they can do harm over the years. The key is to take care of yourself — oh, and get off the hard surfaces, such as pavement, and out on dirt track surfaces or trails, those are much better for you and will keep you healthy. Be aware that much of joint deterioration (how well we tolerate impact) is genetic: if you are predisposed to joint deterioration, there’s not much you can do about it. Good luck and take care of yourself. P.S. The good news is at 62, if you have not had problems, the likelihood of having problems with joints now is less. I like to say “your body has settled into itself.” Good luck to you! I was looking for something to read last night, so on a whim I grabbed your book for the kindle. Well, that was a mistake. I was up all night reading, and I have not been able to put it down. I’m a marathoner who has been getting the urge to dip his toe into the ultra scene. Your book is giving my the inspiration to dive right in. I found it especially cool that your first 24-hour race was at the Delaware Park loop in Buffalo, where I run everyday! I just wanted to say thanks for the great book, and all the inspiration! I’m glad you liked the book and yes I have fond memories of that first 24 hour run. My goal was to run 100 miles and I was able to do more. You will be able to do more than you think you can also. Have fun out there and keep in touch, I’d love to know how the ultra scene is shaping up for you! When I was reading your book Running on Empty, I came across the paragraph where you were advising the Navy SEAL recruits on the 10 Commandments of Endurance. My daughter is in Navy Officer Candidate School, so I sent her a copy of your advice. It has helped her immensely with the physical and mental aspects of this tough training program. Thank you for sharing your wealth of knowledge and experience. Thanks Michael. Love your Tales of the Runner blog!. I’m glad that your daughter liked the book and the “10 Commandments of Endurance” helped her. Congratulation to her AND you…you must be very proud. Happy New year to you and your daughter! hello , i went through the page related to cramps and numbness….. but my granee mrs sampath devi sethiya is suffering from numbness n cramps in feet for past 1 yr…. had consulted so many docs n hav taken all possible medicine but there is no sign of cure or reduction in that…. kindly suggest me as to wat can i do for her in order to cure her…and give her a breath of relief!!!!!!! Nope you MUST stay on the road all the way now-a-days! I hope to see you out there in 2013! Happy New Year. Hi Marshal, I am a trail runner and have een suffering from achilles tendonosis for over a year. I have tried shockwave treatment and rest with some success but still can tell it hasn’t fully healed. Curious as to what you might know about the injury and what course of treatment you would recommend.. Thanks. Eric, I recommend stretching (the calf in particular) and lower leg muscles. I’m sure you have tried icing and an anti-inflammatory over-the-counter drug, such as Motrin. Be consistent about any treatment. I have also found that the pressure caused by the back of the shoe can to irritate Achilles tendonitis, and what has worked for me in the past is cutting a slit down the back of the shoe, right in the middle about ½ inch to start. Good luck! Mr. Ulrich, Your achievement is awesome first of all. I am working on preparing for my first marathon right now. It’s actually my first official race entry but not my first marathon. I had been in ROTC and started to favor running more and more until last year I broke my foot. As soon as I could walk again I took all that built up energy and just ran a marathon for the heck of it. I’m inspired by your journey and would love to do the same (I’m sure you know most people think that’s crazy.) For starters though, how many marathons should I do before I know I’m ready for a 50miler and then a 100miler? Hi Taylor! Congratulations on your first marathon. To answer your question, first I would make sure that your foot is healed up completely, which begs the question: how did you break it in the first place? If it was a fracture caused by running, then you need to be very careful not to increase your mileage too quickly. I would make sure that you have a good solid base before you tackle a 50 miler and would suggest running and slowly building that base for at least 6 months until you are able to make sure that your foot will handle the stress. Then go from there. There is no right or wrong answer for your question, though; some folks can go from 10Ks to 50 milers, but I like to take a more conservative approach and build up to a 50 or a 100 miler by doing the intermediate distances. This will give you confidence, too. But for you, in paticular, your foot should be your guide (how well it is healed and can bear impact). I WOULD NOT wear minimalist shoes, as even if you run on your forefoot (that causes stress also in different forefoot spots) and would stick with something that complements your running style and corrects appropriately if needed (pronation etc.). Good luck! Yes sir! I will keep all that in mind. Thank You! Hi, Lynne! I think the biggest problem is the hard surfaces you have been running on, along with shoes that don’t have much cushioning. If you can choose a race that has a gravel surface or a trail, that should help. Also shorten your stride, and that will reduce impact. Let me know how things go. I recently read your book “Running on Empty”. I appreciate how your journey changed your perspective. Breaks everything down to its simplest elements and allows you to declutter and focus on what is important in your life. As I finished the book and looked through your journal entries and timeline, I realized we shared that perspective enhancing experience at the same time. My experience was quite different from yours but it did make me look at what is truly precious in my life. I ran through college and into my adult life. I ran 400M hurdles and 800M in college, added road racing, then marathons and sprint tri’s by the time I hit my early 40s. On Oct 29, 2008 while on a training run with a friend my heart went into ventricular tachycardia at 230+ beats per minute. Long story short, I was shocked three times in the ER about 1.5 hours later and diagnosed with a rare heart condition that does not allow me to continue strenuous exercise. I miss running and competing every day but I focus on the future and moving forward. I am still here, a father to two great kids, husband to a wonderful woman for 25 years, coach, mentor, friend. I have much to be thankful for and thank God for each day. I focus on what I have vs what I have lost. Perspective can come to you in many ways through many different experiences, but it is a joy to find it and guide your journey. Keep putting one foot in front of the other! Thanks, David. Yes, there’s a silver lining to everything, and your focus on your kids and wife is in the right place. sorry you can’t keep on with your running. It’s been quite a journey for me, but I haven’t had to deal with the challenges you have. Can I ask a favor, please? 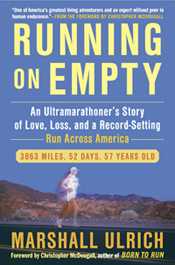 Would you post a review of “Running on Empty” on Amazon ( http://www.amazon.com/Running-Empty-Ultramarathoners-Record-Setting-America/dp/1583334904/ref=sr_1_5?ie=UTF8&qid=1367600966&sr=8-5&keywords=running+on+empty )? I’d appreciate it very much! actually I’m a big Newton fan. I use the gravity and distance since a couple of years for (half)marathons and enjoy how the shoes support running style and give a sound response. Recently I did my first halfmarathon race with some “hills” in Heidelberg and I was happy with the Newtons uphill, but downhill was bad and “offroad” even worse. I just wonder if Hokas could be a good alternative for midfoot runners that wanna do trail running ? And if so, which Hoka ? Yes, Hokas are a great alternative for a mid-foot strike. I like the Mafate 2s, as they have a large toe box and afford great traction. Thanks for the heat training tips. I’m registered for the 4 Desert Grand Slam next year and am excited to relive my wrestling days by hanging out in a sauna! Anyway, in addition to the sauna, do you have any thoughts about bikram yoga? Is that a different type of heat or will that help acclimate for the Sahara? Yes, bikram yoga is excellent training in addition to the sauna. You ARE on the right track for sure! Hello, I now have three pairs of Hoka’s. The first were Bondi’s but i relpaced them with two pairs of Mafate 2’s when they started slipping and sliding in the mudd. I love the Mafate’s but I have noticed that since I started wearing them I am pronating a lot worse. I think this is because there is so much compression they are just allowing my ankel to collapse more. Pretty sure this has contributed to some knee problems I am having recently as well. I’m considering trying the Stinson Evo. Your thoughts would be appreciated. PS: I run long distance and have done a handful of 100 mile events. I absolutely love the Hoka’s but if they are contributing to my knee problems I’m at a loss. I have the same problem and do break the shoes down prematurely, and yes that can cause knee problems. Hokas are a neutral shoe and do not compensate for running deficiencies such as what we have. I am currently trying out the Rapa Nui 2 which has about a third less cushioning and they seem to be holding up well. I have not taken them out on a very long run or ramped up my mileage as this is my off season. So far so good. You might give them a try as they are also less expensive. The toe box appears to be narrower, but with my wide foot they still work okay. One other thing I’m trying is orthotics that have a higher arch and correction for pronating. I’m a 65 year old runner and have been running 10 miles a day 7 days a week for years. I run for fun only, no races or speedwork, and only on pavements. Which of the Hokas would you recommend for me? Miki, give the Hoka Bondi speed shoes a look. Is there somewhere you can try them on? They should be fairly true to size. Marshall – A quick question. I believe I read that you run in the Mafates on the road. The Mafates are interesting to me because of the wider toebox, but all of my mileage will be on the road. Should I just stick with the Bondis or do you think the Mafates will be just fine? What kind of problems might I encounter? I am a semi-new runner who has chronic shin issues. I run half-marathon distances regularly, as I said on the road. I would love your thoughts and thanks for the time. Eric, I do run in Mafates on the road, and over significant distances. They’re my favorite shoe of the bunch — see what I just posted, http://marshallulrich.com/blog/hoka-guide/ , and you can use my chart to compare the two shoes and see what you think. (You might even take a look at the Stinson Evo Tarmac.) Let me know how it turns out! If your bio mechanics are not normal you may experience excessive wear and premature breakdown of the Hokas. Stinson’s should work okay for you and they may be worth a pricey try, at least once. If you do try them would you please post your comments here as others may well benefit from your input. Sorry I can’t be of more help in you case. Which would you prefer for walking, even though they are a running shoe? I have very high arches and with a pronation. I’m not familiar with the Brooks Transends, but I can tell you I have walked many a mile in Hokas and I believe they strengthen and save my legs from excessive impact, even walking! I wonder if you can help me, I have only just started ultra running at 42 and find that when i am out running after a few miles my middle toe on my right foot feels like its been put into a vice. I have tried different shoes and buying up to a full size bigger but I still get this pain. Any ideas on how to fix this ??? A couple of things come to mind. I don’t know if you are using orthotics, but I have found that they help take some pressure off of some of my toes particularly if the orthotics have a metatarsal support. I would not get the cheaper over the counter kind, but look for a pair that are semi-flexible, 3/4 length will do, and they can be found on line…just look for a pair that are around 40 to 50 U.S. dollars and they usually are constructed well. The other thing that I have tried to taping your sore toe to the one next to it, preferably the longer one and it will act as a splint. Let me know if either solutions work and good luck! Thanks for getting back to me Marshall I am doing a mountain marathon In the lake district this Sunday and will try taping my toes. (My first marathon) I will let you know if this works. By the way I am half way through your book and must say you really are an inspiration. Good luck with any future projects and thanks again for inspiring me to get out on those trails as I like yourself find this the perfect way to sort out all the problems, stress a and worrys bouncing around in my head. I have nice success with Dr. Jill’s Gel pads. They are fairly cheap and you order them on Amazon.com. I place them on the balls of my feet and it has been the only thing that has helped this annoying cotton/bruise like feeling in the balls of my feet. After 5 years with this bruise like feeling, I still have it. It never has healed. Also, I just purchased Brooks Transcend running shoe. Just one week is use, but so far they are grrrrrrrrrrrrreat. Please keep me up to speed and let me know in a month or so how everything is going. I’m glad you may have found a solution to your foot problem! I have heard from many people that they were recommended HOKA’s by their foot doctors and most of the time they work. I would say keep wearing them and see if your mid-foot adjusts, but only if things don’t get worse. As with any shoe, you are putting pressure on your foot in places that there wasn’t pressure before, so the foot must adjust and that will take time. Let me know how things are going! I’m about to buy a pair of Hokas so I spent some time reading reviews which is how I found your site. I was very interested to read your posting regarding which Hoka to buy. I noticed that the post was written about 6 months ago and I was wondering whether that info still applies? For example, you mention the Bondi but not the Bondi 3 – is there a difference? I’m in the unfortunate situation of not being able to look at the shoes myself; I live in South Africa and we do not get Hokas here. I’m ordering a pair over the Internet and am struggling to make up my mind. I’m leaning towards the Bondi 3. The purpose for the shoes will be the Comrades Marathon which I’ve run many times (19); I’m pretty light (66kg) and have a natural mid-foot strike. I will only be using them on the road; I have a whole bunch of trail shoes that might be replaced by Hoka at a late stage – but not now. So for a mid-foot striking, experienced runner, looking for a high milage racer-trainer for the road, does the Bondi 3 sound about right – or should I be considered one of the other models. The Bondi has gone over a few minor changes but essentially is the same shoe. I copied this description for you and to answer your other question, if you have a neutral gait this may be the shoe for you (note that the Bondi 3 has great mid-foot cushioning). 19 Comrades, wow! Let me know how this shoe or one you choose works out: If you have a high arch, are a high-mileage runner, or want the maximum amount of cushioning, Neutral+ is your shoe style. Enjoy a smooth ride with enhanced cushioning and reduced impact with improved shock absorption. If pronation is not a problem then choose Neutral+ shoes. When choosing running shoes, find your perfect fit using this chart. Category types are based on factors like arch height, running habits and body frame. The shirts I wear out at Badwater are two kinds, first I cut the sleeves off and shorten around the waist (so the t-shirt is just above my waist band allowing evaporation but water/sweat to not drain down into my pants) plain old cotton T-Shirt’s. Second, the long sleeve shirt I had custom made by North Face and are made of a cool max fabric. Note that those shirts have long sleeves that cover the top of my hands so they won’t burn. Loose fitting is the best to allow air circulation. Rail Riders has a similar shirt that works well: http://www.railriders.com/men-eco-mesh-shirt-p-963.html Also Ex Officio has a ventilated shirt with a collar that you can turn up that I have used: http://www.orvis.com/store/product.aspx?pf_id=19RC&adv=127748&cm_mmc=plas-_-SaleOutlet-_-19RC-_-127748&kpid=19RC-04-53&cagpspn=pla . Hope this helps! For some time I have had Achilles pain and following my first 60m last June have done very little running in the hope this will help let my body recover. I’m interested to know how you managed your recovery from Achilles pain following your run across America and whether you kept running despite the injury or took time out and then gradually built back up. Id love to hear any advice you have from your own experience. So sorry as this post fell though the cracks. Are you still having Achilles pain or has it been resolved? I was wondering if you had any advice on recovering from iliotibial band injuries. Mine flared up for the first time ever halfway through the Javelina Jundred and had me limping across the finish line. It’s been nearly 3 weeks since the race and there is still tightness on the lateral side of my knee, though the swelling has gone down significantly. I’ve been stretching/foam rolling, and seeing a chiropractor for active release. Any advice on speeding up the recovery or when to resume training? So sorry for the VERY late reply. Has your iliotibial band injury been resolved? Marsh, I discovered your website while researching Hokas and I have a question for you, please. I love both trail, as a matter of fact, I really love trail running, but I also like hard surface running also. I’m going to Hansons running shop this weekend and I’m wondering what Hoka I should levitate towards? Does Hoka make a shoe which handles both on-road and off-road? Thanks for your time and thanks for your website! I would try the Stinson ATR . I have the Stinson ATR 3 and it has a trail tread, but I use it for road too as it doesn’t compromise cushioning or stability. The forefoot is wide enough and it seems to be true to size. Good luck with your search when you are at the store. p.s. They may have other Hoka models that you can try too! I’m sure you do not remember me. I originally met you at a NYC marathon Expo, I believe 2010. I also came to one of your book signings in NJ that year. In fact we had a short run together at the book signing ( I did not appreciate at the time the gravity of who I was running with). As I get older(I just turned 60) I appreciate the things you have accomplished more and more. I am registered for the Pikes Peak Marathon August 19th 2018. I was wondering if you had any thoughts on it you may want to share? Also moving forward, do you do training via phone/Internet? I live in Warren New Jersey. Joe Rotondo again. Ii purchased Salomon Speed Cross 4 and Hoka Speed Goat 2. Which do you reccomend? Is there another I should try?